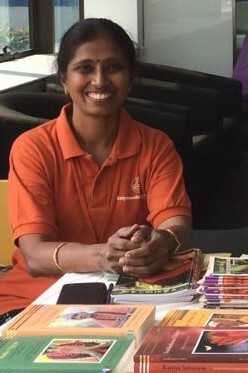 Aruna was introduced to Satyananda Yoga Centre by her son, who had attended our yoga program in the school he studied in Chennai. She was impressed by the interest our course had brought in her son, agreed to give yoga a try! Then it has been a story of no turning back again. After going through the Basic Courses 1&2 Aruna completed the year long Sadhana Shibiram and a two year Teacher Training conducted by Sn Shivarishi. Systematic, Disciplined, Committed, Meticulous, Dedicated, Sincere, Eloquent,qualities that she has makes her a lovely Satyananda Yoga teacher to learn and imbibe yoga from.